New to our store is a toilet supply with metal connectors. Some condominiums and apartment buildings are requiring these to be used with any new toilet install. Why the change? This is often a requirement now-a-days with apartment complexes because plastic connectors are more likely to break over time and cause a flood to an apartment that sits below the leaking connection. The result can be thousands of dollars in damages! Be sure to check with your building code in regards to a new toilet install. If unsure, we suggest you go with these new ones with the metal nuts since they only cost a few dollars more. Please note, we don’t want to scare you from using ones with plastic connectors, since they have been used for decades with limited occurrences of such. It is important to not over-tighten plastic fittings and to replace them when they are getting old. Certainly, if you are installing a new toilet, we would always recommending starting with a new flexible toilet supply line. They often have a limited warranty of about 7-10 years, so with a new toilet should come a new supply line! 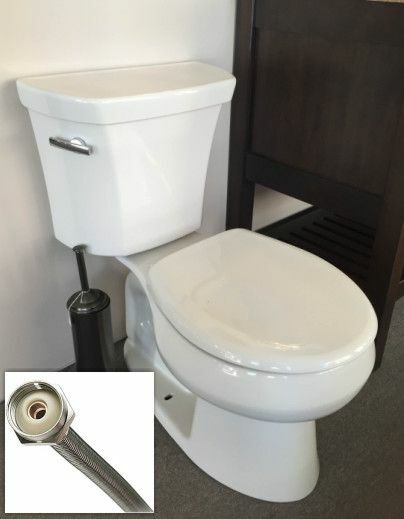 Currently, we are only stocking the new toilet supply with metal connectors in a 12″ length, since it is the most popular size. If you have any questions about these products or more, please stop in and talk to our experts in our Plumbing Department.